The 24-year-old heartthrob says friends refuse to visit him when filming in remote locations, so he’s adopted a four-legged friend for company instead. He said: "I know it's sad. A lot of actors have a bunch of people who kind of just go up and stay with them for like two months, like an entourage. But my friends, their egos are too big. “That's kind of why I adopted the puppy. It's from a shelter and he was going to be put down. I only got him two or three days ago." 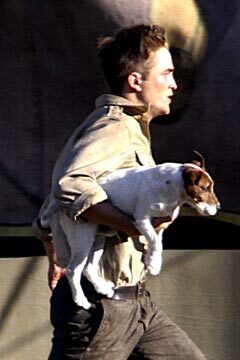 The British actor – who is dating his ‘Twilight’ co-star Kristen Stewart – also revealed he has taken his new pet overseas with him and joked about naming it after himself. He told the Daily Record newspaper: "He's been freaked out. It's funny. I got a private plane here from Louisiana, where I was filming 'Twilight', so he came out of the shelter and the next day he's on a private plane. A bit like 'Lady and the Tramp'. I'm going to call him Robert." The star once admitted a "deep connection" between him and dogs, saying if he had to swap his human form for any other he would choose to become a canine. He said: "I think I'd be a dog. The lifestyle of a dog has always fascinated me: You sleep, sit around, get stroked, eat and get walked from time to time. That's great! "There is a deep connection between me and dogs."